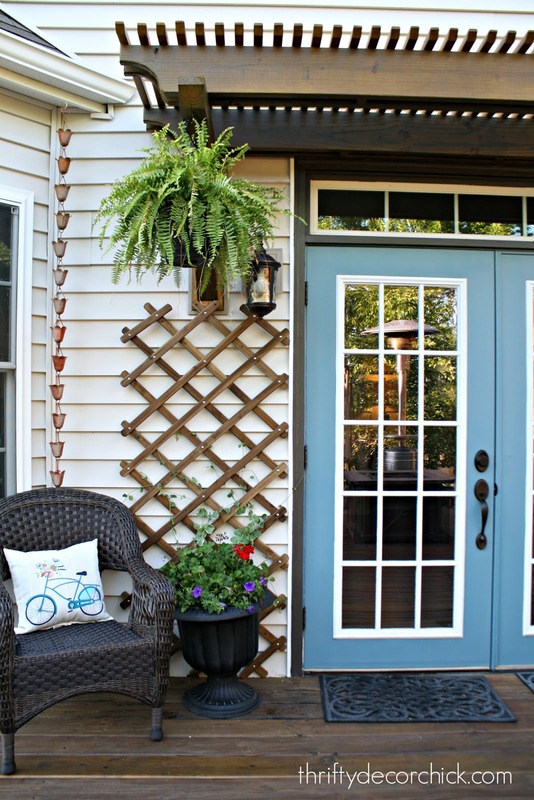 Our beautiful back door transformation! Goodness! I've been so excited to share this transformation with you! It's been in the works for a few months and then the lovely folks at Kwikset asked if I'd like to share a door transformation with you and it all worked out so perfectly! It is SO GOOD! They were a total game changer for our house. They let in so much light and make everything feel so much more open. One of our best decisions ever. You'll notice they look like French doors, but only one side opens -- we were told that double exterior doors (that both open) can cause problems over time. This was such a great compromise. The look without the issues! I think I told you then that I had big plans for this spot outside...I've had this in mind for a long time! AND that hardware had seen better days for sure. Then I did a very light sanding to make sure all the chippy paint was gone. I repainted that part of the door and then tackled the hardware. I was so thrilled when Kwikset offered us new hardware for our exterior doors. One, because they were looking worn after all these years. TWO (this is the best part) -- they provided stylish and durable products with Kwikset's SmartKey security feature as well. Because I've changed out our hardware years back we were using THREE different keys for our exterior doors. It was way too much. 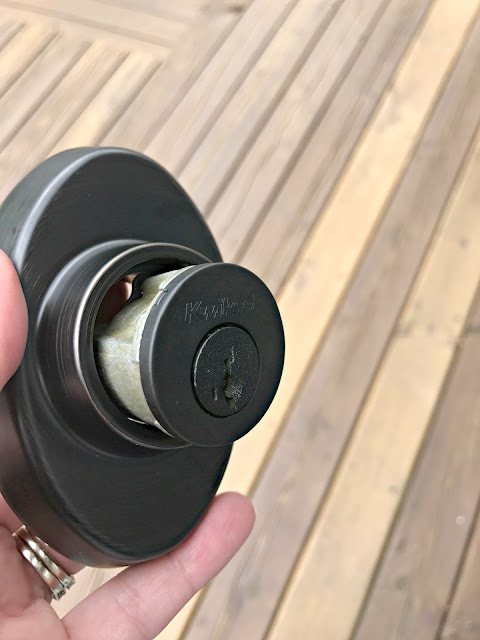 This awesome product not only helps to protect against common and destructive break-in methods, but it also allowed me to easily change the key so that ONE works for all the doors. But first, more about the pretty hardware. 😍 There are a few DIY projects that I know people avoid because they seem too difficult. This is one of them -- but I think it would surprise you how easy it is to change out both interior and exterior door hardware. Looking better already, right? 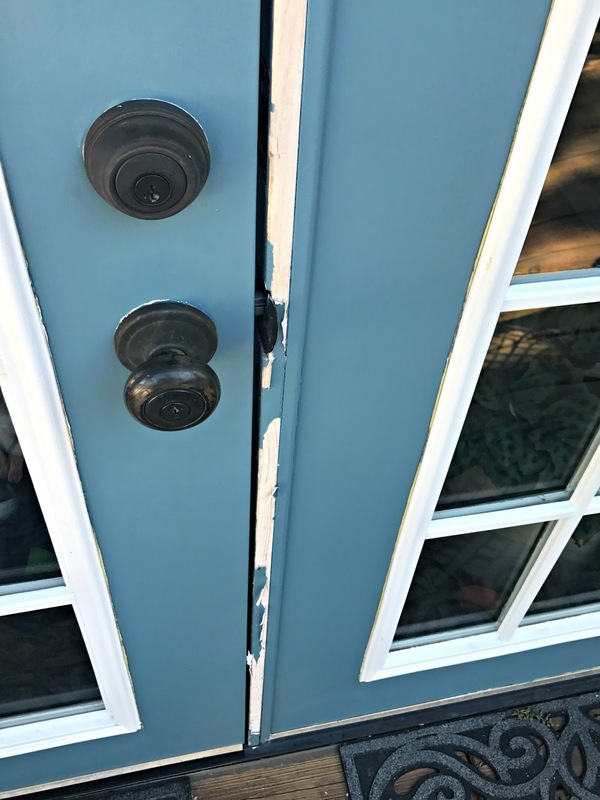 If you paint your doors you really should take the hardware off -- it's really not that bad! I've learned from experience that you'll kick yourself for not doing it if you ever change your knobs later. Because I was changing this out from a knob to this nicer handleset, I only needed to add one hole at the bottom to screw in the lower part of the handle. I just used a drill bit to drill through the door and then screw it in. More on that in a bit! 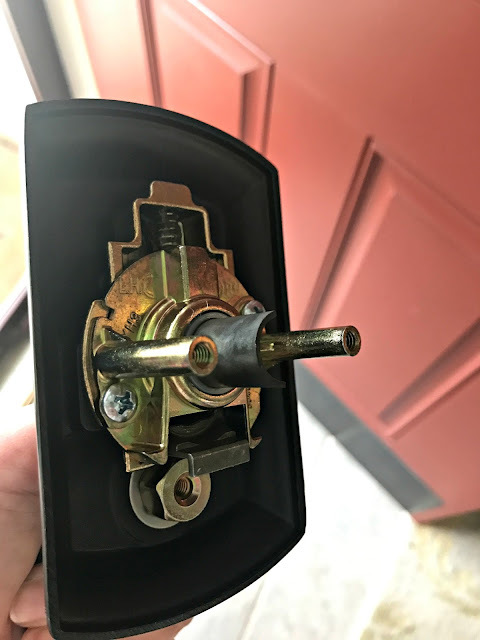 The Kwikset SmartKey product offers better security because of their unique design that protects against lock picking and lock bumping -- I had to look up that last one. There's been an increase in those occurring in home burglaries. The longer the better for these! And presto! Your key works on ALL OF THE LOCKS. Hello! I cannot tell you how nice and convenient it's been to operate with one key! 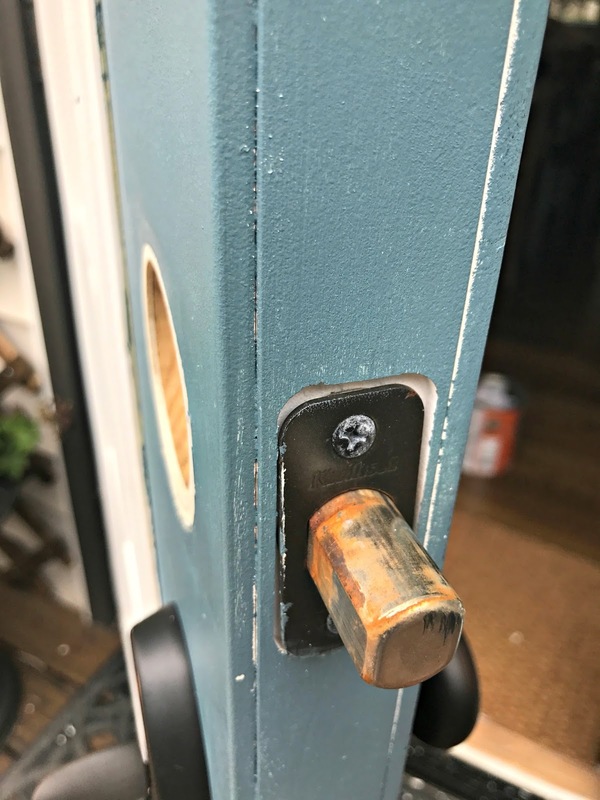 I was able to change out our front door hardware as well -- and followed the same process. There are a couple little tricks the Kwikset hardware offers that I wanted to mention because you may need to know these if you tackle this project. If your hardware has this section facing the other way the fix is EASY -- you just tug on that half circle metal and then twist. It flips over to the other side. Takes two seconds. Brilliant. If yours isn't centered this fix is easy too. It was at 2 3/8 and I needed it to be 2 3/4. Again, so easy! 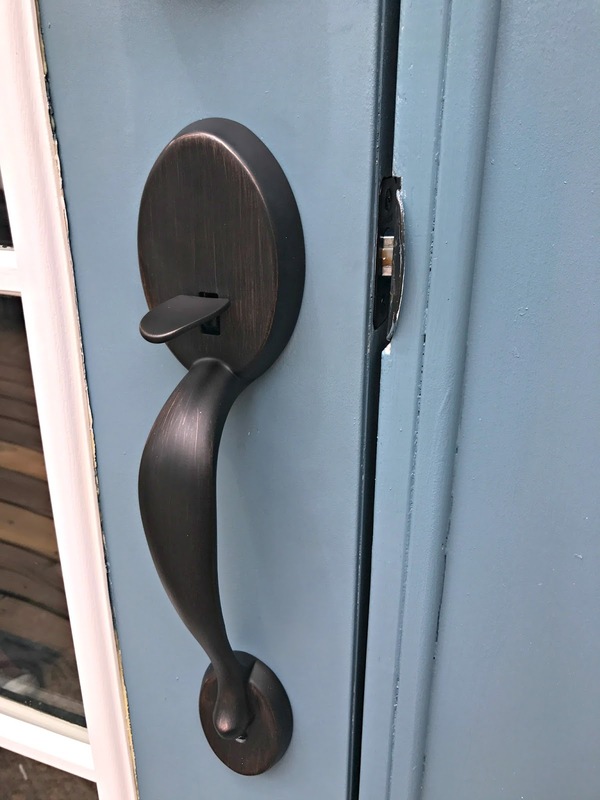 I used the Chelsea handleset for this door and this Avalon set for the front door -- both in the Venetian bronze finish. 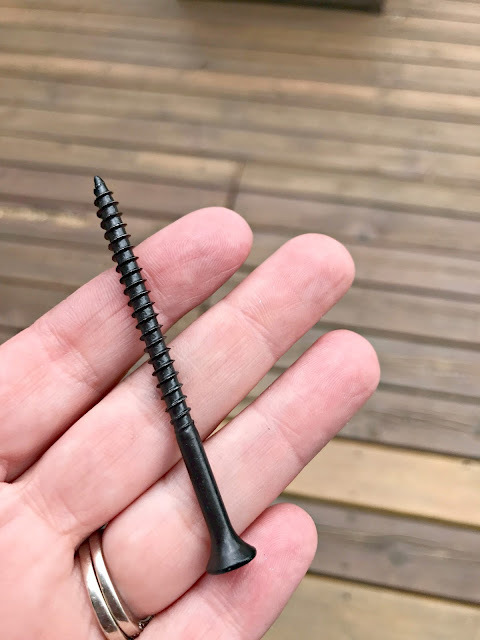 Remember -- when you install hardware the screws always go on the inside! :) This goes for in the house too. You want to make sure you can use a screwdriver from the inside if you're ever locked in a room for some reason. OK! Now for the transformation I couldn't wait to share with you! I've always wanted to do this, but when we finished the pergola last it was decided it would happen. We just weren't sure when. Holy cats, isn't it beautiful?? I've been dying to show you! It all came together so beautifully. 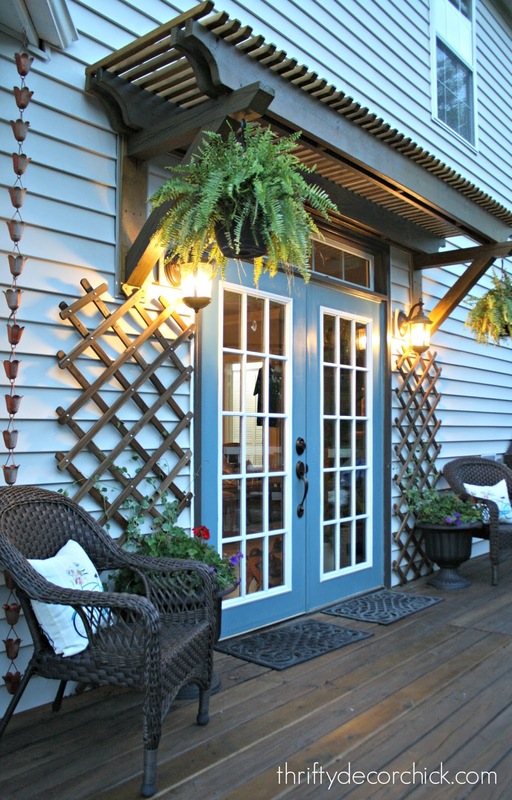 We had the trellis built over the back door to match the pergola -- it's a similar design but simpler. Our door opens out (something else I'm so glad we did) to save space inside. It's not been a big deal at all, but we knew from the start we'd want to add a little something over the door eventually. Not a roof, but just enough that it would provide some cover from rain and block some snow from falling right there. I've had the pots for years -- I spray painted them a couple years ago to give them new life and it's held up great. And aren't those pillows perfect with the door color? It really helps to break up the expanse of vinyl on the house. We just adore it. Gah. I just love it. The expanse of vinyl has been broken up just enough. It took a few months to pull it all together but I'm so happy with it. It's just beautiful. And the new hardware is like pretty jewelry on the door -- it makes it feel like so much grander of an entrance. 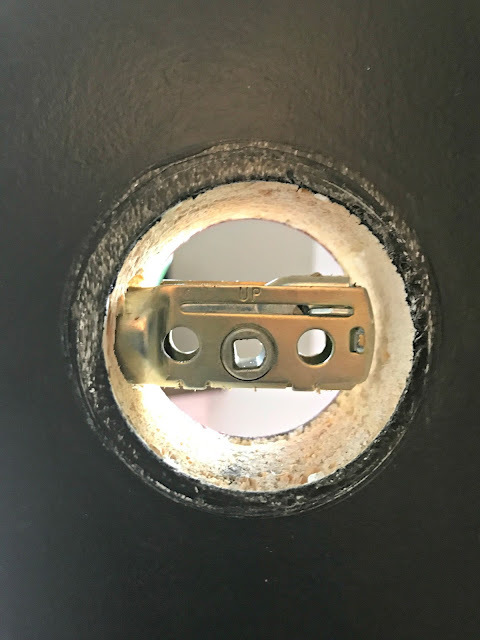 Thank you to Kwikset for the hardware -- I can't recommend that Smart Key feature enough. If you ever lose your keys or they are stolen, this makes it easy to re-key the lock in just seconds. I couldn't believe how easy it was. I've been dying to share this one with you! I hope you enjoy it. If you have questions about anything feel free to ask! This post is sponsored by Kwikset and they provided the hardware I used. All opinions are my own and I only share brands that I know and love with my readers. This area turned out beautifully!! I'm in love with the new trellis and the new hardware is gorgeous. I have the same problem with 3 keys for exterior doors. Such a pain!! Love the back porch and it's new trimmings. The roof and the trellis are fantastic including those wonderful new locks. Working on my rear French door now! You may have inspired me to paint it a different color! What an amazing tranformation! Simply gorgeous! Beautiful area!! Would love to win!! We are also a three-keys-for-exterior-doors household. What an ordeal. Your patio is looking amazing! Love your new overhang and trellis! 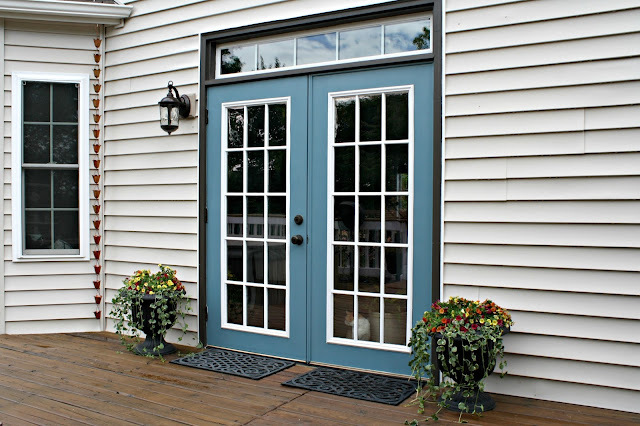 I've painted my triple french door almost the same color. Would love a new handle/lock to finish it off! My poor front door is in the bright sun and the knob and deadbolt have not held up well. A new one would be amazing and would make me paint the front door too (it's been on my list for 2 years). 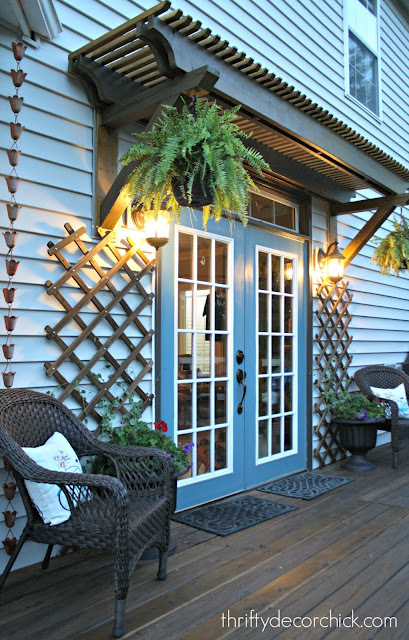 Your back porch is so dreamy now! The transformation looks great! Our knobs have seen better days so this would be a great refresh. Wow, the finished look is beautiful. Crazy what a little paint and colour can do. I LOVE the handleset, t really glams up the back door! What a huge difference, I love it! Makes you excited to use the door!! That turned out beautiful! We need new hardware so bad!! I need new door hardware in the worse way - My back door and garage hardware are tarnished gold - not a pretty sight - your door is lovely. Love the new door cover and trellises! My back door still has cheapest builder grade brass knob! Your deck is so beautiful! I love all the updates you have made over the years. I have two questions: how do you deal with bugs when you are sitting out there in the evenings? And what is that coppery thing you have hanging in the corner to the left of your doors?! Love the new look! You are such an inspiration to take the house you have and make it a home you love! Happy 4th to you and your family! Looks awesome! 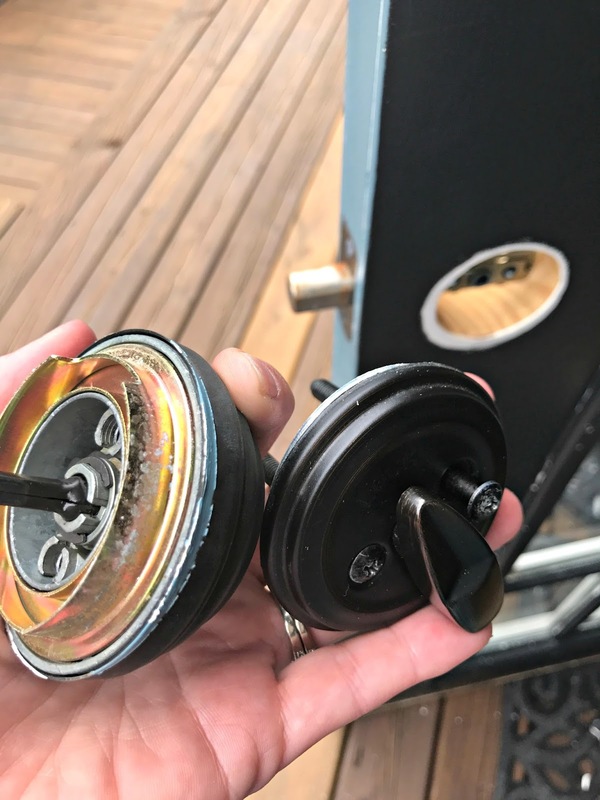 Great outdoor space and I've been curious about the smart locks. The whole area is such a lovely statement now. As always, inspiring. The hardware install feels a little intimidating; thanks for spelling it out. 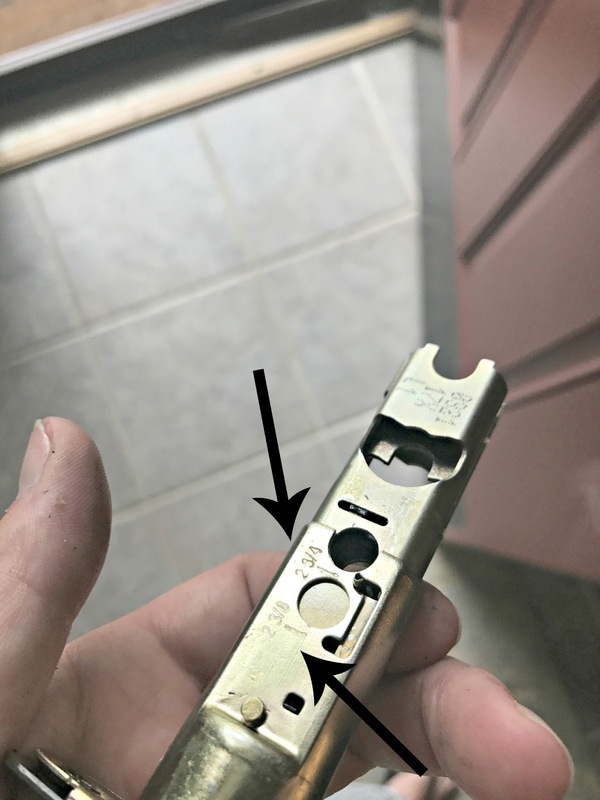 I wonder if you or Kwikset could address the security issue of a small tool which when inserted can be used to allow/change the access to a different key. I love the way by which you have made the door of your home. Thank you very much for sharing the detail about us to provide us clear idea about it. You seriously amaze me with your skills! That is a terrific transformation!! Love the trellis and the new hardware! Always enjoy seeing what you come up with! I've just added that exact door knob/deadbolt to my wish list the other day- we just remodeled our mudroom (entry from the garage) and had tried spray painting the current gold toned knob to ORB, but it's scratching off and looks terrible - time for a new knob! 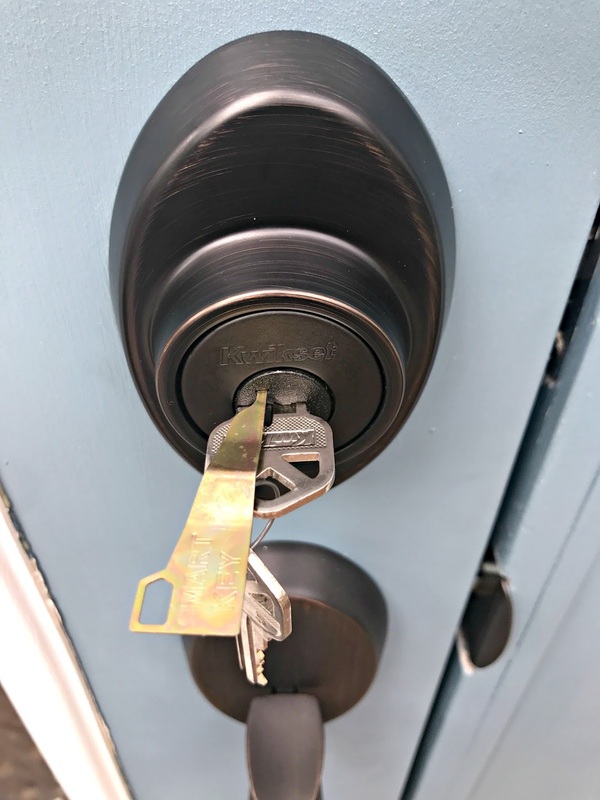 We replaced all our door knobs with the Smart key Kwikset in our previous home and the new owners were so happy that they didn't have to change all the locks! Such a great feature. The door and the hardware look absolutely beautiful! Well done. What a beautiful transformation! I love everything about it! I love how this turned out, the color on those doors is awesome! Looks pretty I didn't know you can have the option of French doors that open out. We have what you do with the one side opening only but we have to move our dining room chair to open it all the way and it's a major pain. I really didn't want to go to a sliding glass door so this is good to know. Love the new hardware. We need new on the same door I was discussing. It is brass and it's so weathered and horrible-looking. Love it!!! Such a beautiful space!!! Time to update our hardware. It's straight out of the 1980's! I love it! We need to replace hardware and I was trying to decide what to get. I didn't know how I could buy what I want and still have one key for all three doors. Thank you for reading my mind! I love the update! The little cover/roof over the door is perfect! Great transformation. We are needing to update our front door and this post has inspired me! I am pretty sure our front door hardware is from the 80s. This looks so pretty! I love the blue color on the doors. We have a door like this that could be updated with a new lock so this would be perfect timing to win! Wow so beautiful! I would loveeee to change out our front door hardware! It is just a round brass knob currently, but I know it could be so much better. Great makeover! Very pretty! Love the door color and hardware! Love the new hardware! Would love to update mine! It looks great! All of it! I'm going to have to go check out these smart locks. I must be missing something, but I would think a thief would just get one of those little pointy devices and reset locks to get in. DUH! I just read about the Smartkey and you have to have the working key to rekey it. That makes so much more sense. I knew I had to be missing something. LOL! Good to know! I was wondering about this too!! Beautiful! We are in need of a back door makeover as well. I love all your ideas! A lovely makeover and thanks for the tutorial! This is beautiful. And, thanks for the smartkey info. We've been thinking about doing this because we have SIX different keys for our exterior doors. SIX. Ugh. Everything about the transformation is gorgeous! And,I totally understand about symmetry.... I'm the same way! I'd love to get to pretty up our front door! Happy 4th of July weekend! 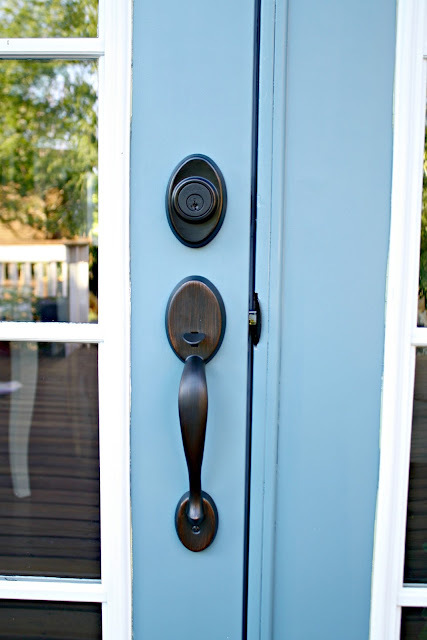 I have 2 different keys for my exterior doors and this is such a smart solution! I love the transformation and the colour of the doors! Happy Canada Day. Our doors are all keyed to the same key but the locks were put in, in 2001. One of them (the one we use the most) has had it and it locks us out all the time. 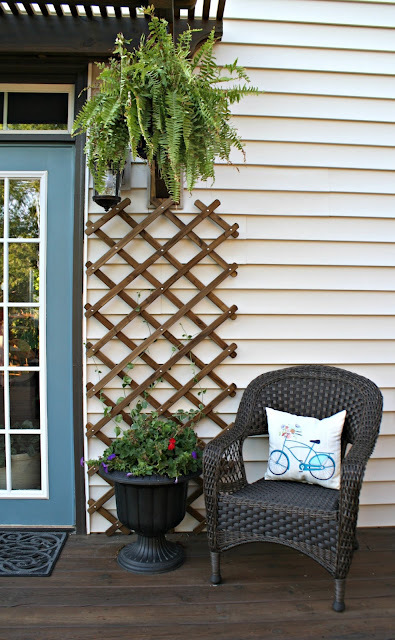 You've done such a beautiful job transforming your outdoor space! Love the door and the new locks too! Wow! Beautiful transformation, Sarah! 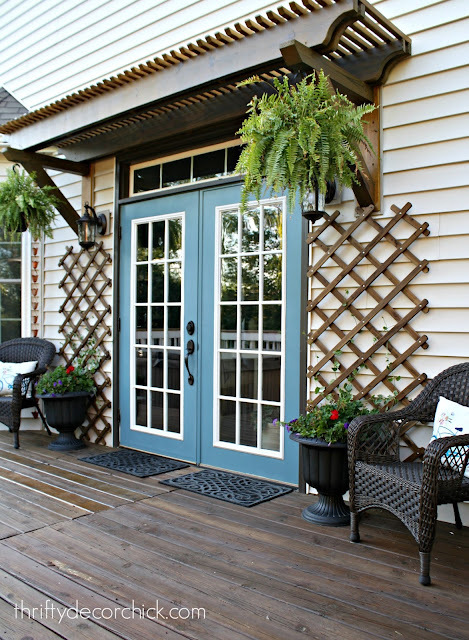 Love the color you selected for the door and the "styling" with the two wicker chairs flanking it - looks so inviting! Thanks for the introduction to Kwikset Smartkey. I didn't even know that a product like this existed! Love that it's available at our local Home Depot and Ace Hardware and is very-well rated online. I'm fairly new to your blog, having just purchased a new (117 year old) home -- we moved in 4 days ago. :) I just love what you've done with your door; everything works so well together. We have many very old doors here with extremely old doorknobs and hardware (and layers of paint on them, yay!) so the thought of new doorknobs brings me much joy! I've been following your blog forever, but never commented...I guess that means I could really use a new doorknob! Lol. I do enjoy and appreciate all your tips! I'm going to be painting our front door soon and plan on changing the hardware too. This looks like a great choice! I also love the color of your doors. I'm consistently impressed with your projects and love your decorating style. Happy 4th! Love Love Love all of it. Wonderful post and great ideas. Like another reader said, I'm going to be painting my front door too. Beautiful new hardware would be soooo nice. Happy Fourth of July! Oh my goodness, what a transformation. The hardware on my doors is in such disrepair, you have given me hope that the job might not be as daunting as I thought. What a difference it makes. Did you build the overhang or buy it that way? I need one of those! 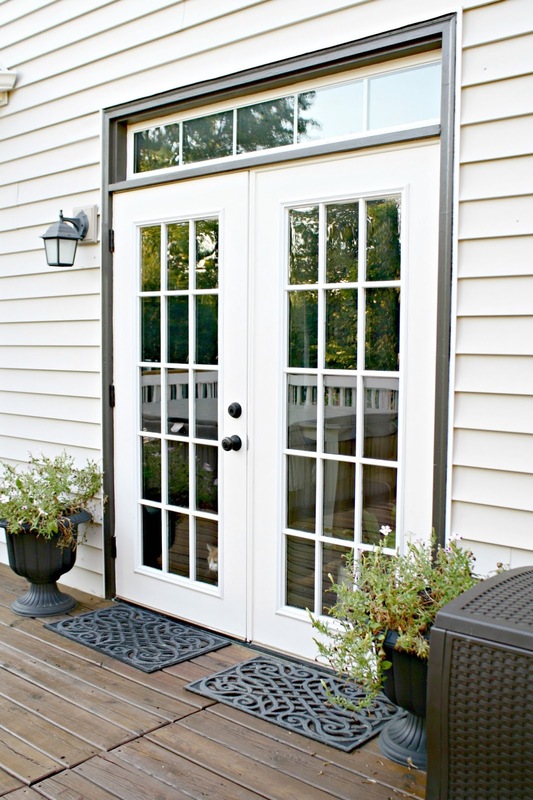 We are removing our old sliders and installing French doors so a new lockset is on our "buy" list. Love this! We are building a deck now &% putting in the same type of door! So pretty! I have several doors that need updated hardware… Hope I win! I found your blog not too long ago and I love it. You are my very favorite. Love your ideas and creativity. We added the hinges and handles to our garage doors (like you did to yours) and it is exactly what the house needed! I'm thrilled every day I come home to see them and I owe it all to you! I had no idea something like that existed. I thought garage doors with hinges and handles had to be purchased that way. 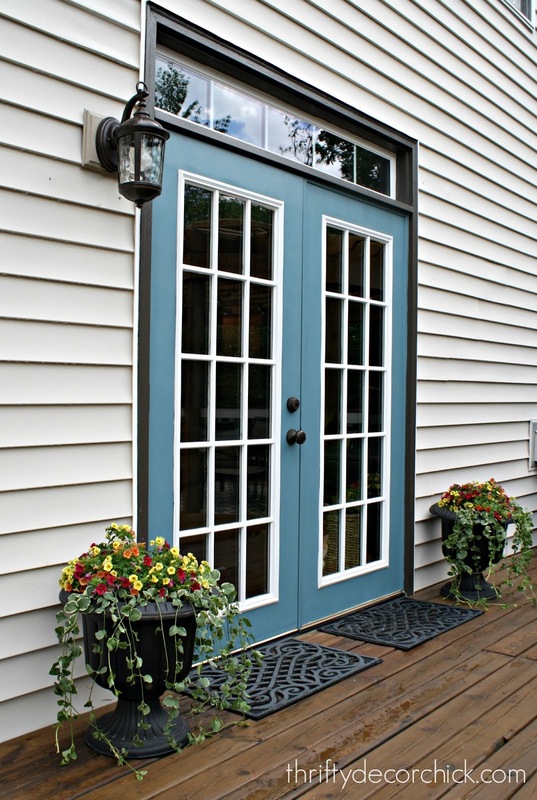 Love your new back door and I'm happy to know about the Kwikset Smartkey. I'm adding that to my wish list! ThanKS for the giveaway! Someone was just telling me the one key idea and it sounds so much better than what we do now! Beautiful back door! I love your style and look forward to your posts. You've inspired me to update several things to my home. Thank you for sharing your talents! Such a transformation! You have inspired me to get to work on our French Doors that are looking a little worse for the wear!! 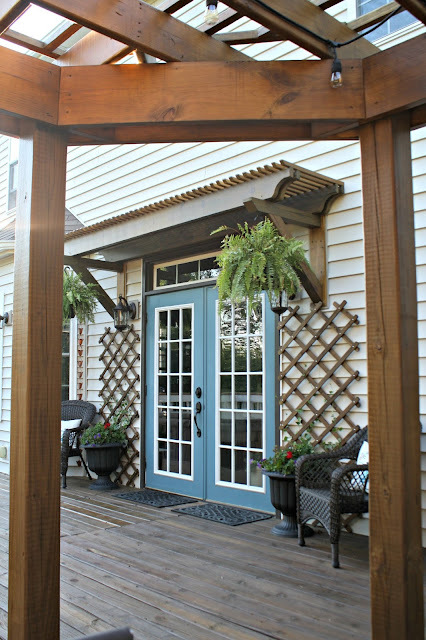 Love the transformation and how it ties together with the pergola so well! I had no idea it was possible to buy a new knob and have it work with an existing key. Amazing! Your door transformation is just beautiful. What a beautiful transformation! I have always liked the look of a pergola. I wonder if a clematis would grow on your trellis - it would be very pretty! It's amazing how that handleset transformed the door. I love the color too. Wow - looks wonderful! We're redoing our front entry and were concerned about the multiple key issue - thank you for answering our question!!! Would love to update my hardware! Yours looks great! So pretty! 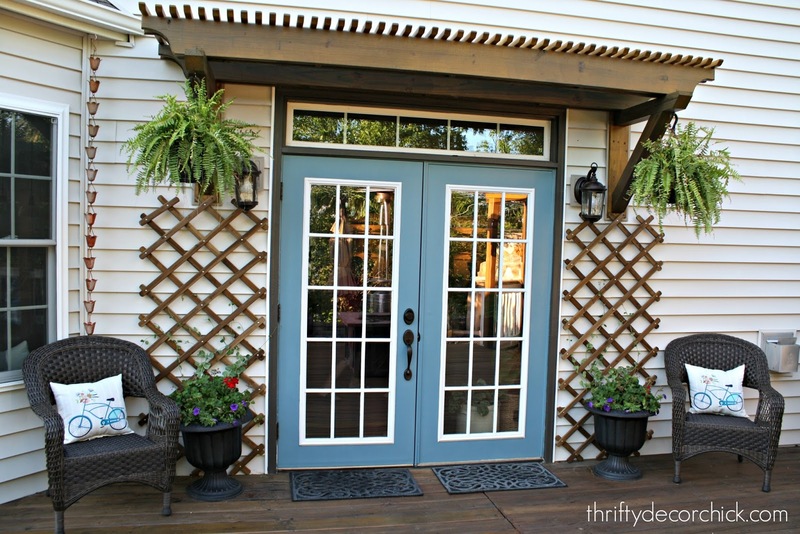 Love the trellises and the blue. The new hardware looks great! 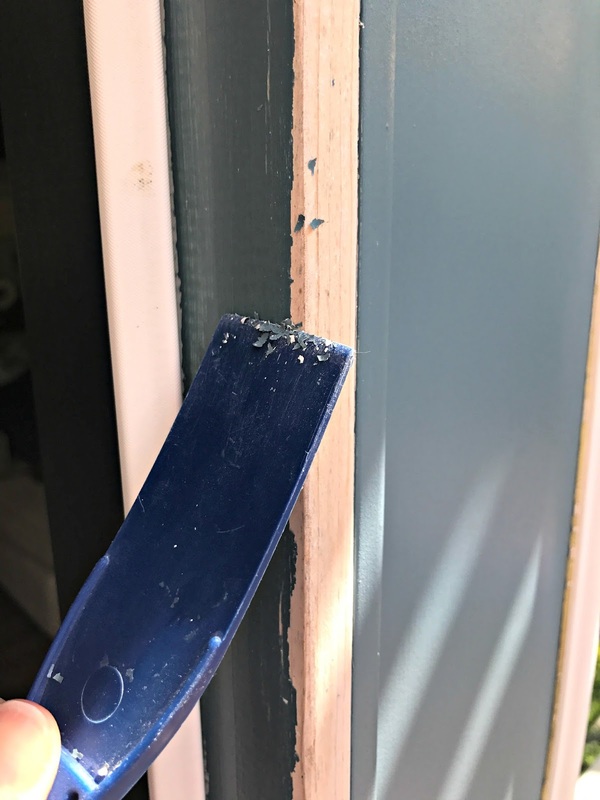 That looks beautiful, and I can attest to the fact that painting your door with the hardware on is definitely a mistake! Now mine is both peeling from the sun and paint-streaked. Yikes. LOVE the transformation!! so inviting!! The blue door looks lovely. What a great job. Looks gorgeous! 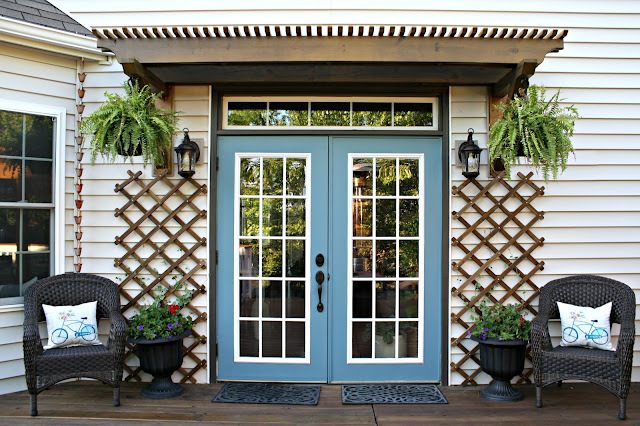 Love the door hardware and the mini pergola over the door. 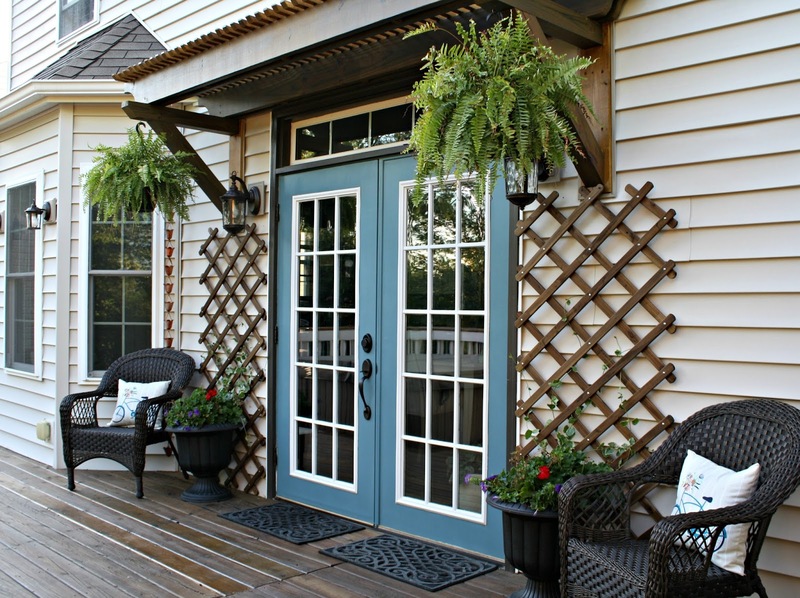 Trellises are a nice touch too! Love this! How well does the copper bucket rain thingy in the corner hold up in Indiana weather?? It looks FABULOUS!!! love it all!! Looks very cozy & inviting. It looks lovely...love the pillows! love the little cover over the door, great little addition without having to add a full roof! Love the finished product. However, aren't you concerned someone could come to your house and pop out the pin in the hinge since it's on the outside, and have easy access to your house?! I have been wanting to replace my front door hardware forever and this would be perfect!! You do realize that by turning those doors around to open outwardly you've created a huge security risk? Anyone can pull the pins out of the hinges to gain access to your house, even when the doors are locked. Oh my goodness -- we have not. I do check these things before I change them. :) Doors that open outward have security hinges that cannot be removed.